Save now on roadside assistance that covers you anytime, anywhere and in any car – passenger or driver. 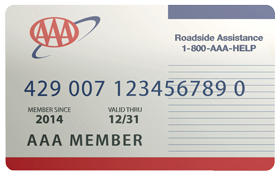 Get 24/7 Roadside Assistance more than 54 million members trust. Travel discounts on hotels, rental cars & vacation packages. Save at thousands of retailers in-store, online, and by phone. Get discounted attraction & movie tickets across the country. Membership | Travel | Insurance | Contact Us | Find a Local Store*Pricing does not include one-time $20 enrollment fee.